Where Do Chicago's Bats Hang Out? 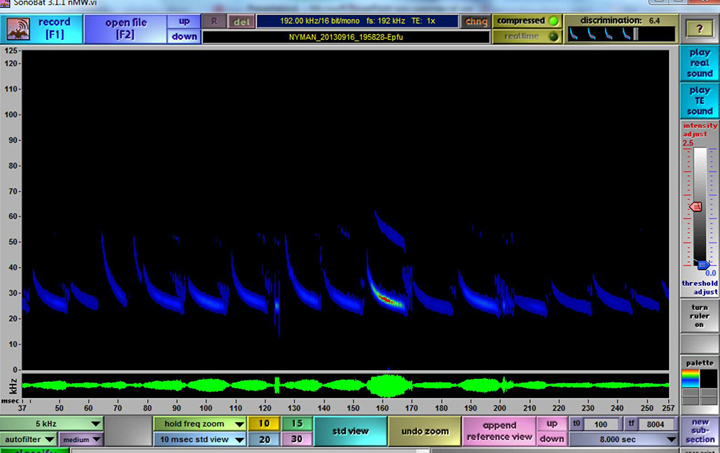 A screenshot from Sonobat software that shows bat call frequency and species. Researchers can use this to determine how active certain sites are. 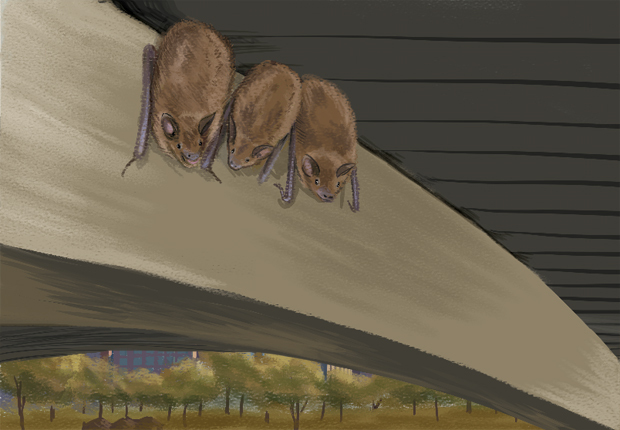 Little brown bat populations, illustrated above, have been decimated by white-nose syndrome in the northeastern U.S., but researchers have detected bat calls from them at the Lincoln Park Zoo's nature boardwalk. Rory Keane was ambling around Chicago’s downtown a few years back when he stumbled upon what looked like a piece of fried chicken glistening on the sidewalk. But it didn’t take long for him to be disabused. How many bats are in Chicago’s Loop? What are their favorite hangouts? Spoiler alert: Our experts say we can’t pinpoint exactly how many bats call the Loop home. Nor can we locate particular buildings the critters like, either. (Alas, someone else will have to explore whether the gothic tower atop the Wrigley Building acts a bat-magnet). But experts can say which types of environments Chicago’s bats like to hang out in and how popular those sites are. The takeaway is that these furry fliers are likely closer than you think. And, beyond that: All this bat activity’s a good sign, given that there’s an ominous threat to their very existence. By 2013, the scientists had set up 18 bat detectors in various habitats around Cook and Kane counties: forest preserves, golf courses and at the Lincoln Park Zoo’s Nature Boardwalk. As much as we hate to let Rory down, none of these detectors was in the Loop. The first one: Bats probably aren’t hanging out downtown. Liza Lehrer, a research coordinator at UWI, says bats might fly through the Loop looking for food, but likely wouldn’t make a home in urban infrastructures like skyscrapers. But if we were to try to pinpoint a bat hangout in the Loop, Lehrer says, be on the lookout for older, cozier buildings with lots of nooks and crannies. Lehrer says it’s hard to put a number to how many bats hang out in urban infrastructure. But she wouldn’t be surprised if there were 1,000 or more bats living in older Chicago neighborhoods. The second reason why UWI didn’t place bat detectors in the Loop has to do with sound. Julia Kilgour, a former UWI bat researcher, says the sheer noisiness of the Loop makes it a bad environment to pick up bat calls, and it’s even noisier for the bats themselves. If you were sick the day they talked about echolocation in school, here’s how bats navigate the world. Their eyesight isn’t so hot, but their hearing is. Bats send out ultrasonic calls, which bounce off trees, buildings and prey. They listen to these echoes to locate who and what is around them. Echolocation is not a problem in quiet, rural areas; but in dense, urban areas like the Loop, bats have a harder time pulling it off. UWI researchers had plenty of other locations to gather data from; they’ve analyzed thousands, if not millions, of bat calls gathered from forest preserves and golf courses around the Chicago area. Liza Lehrer says she’s counted up to 3,000 calls from one detector in a single night. Another interesting finding? Bats really like golf courses. “You may not consider that an area for wildlife, but there’s lots of bat diversity in golf course sites,” Lehrer says. Golf courses aren’t as dense as the city’s forest preserves and typically contain a small body of water, so they appeal more to tree-roosting bats, such as the hoary bat and the eastern pipistrelle. 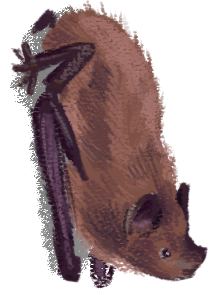 (To see a breakdown of favorite bat habitats around Chicago, check out our visualization by artist Erik Rodriguez, based on research provided by the UWI). But the finding Lehrer says she’s most excited about is that all seven species common to Northeastern Illinois have been detected at the Lincoln Park Zoo’s Nature Boardwalk, a mere three miles north of the Loop. Finding all seven bat species so close to a dense metropolis is especially exciting, Lehrer says, because several species are directly threatened by white-nose syndrome. Since white-nose syndrome spreads when bats are hibernating in close proximity, Lehrer says, “some caves have found up to 90 to 100 percent mortality.” According to the U.S. Fish and Wildlife service, the disease has killed millions of bats across the U.S. and Canada. There have been confirmed sightings in Illinois, as well as several neighboring states. The disease is hitting some bat species harder than others. 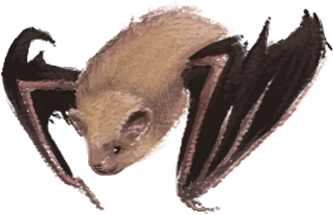 Of the seven species that call the Chicago area home, the big brown bat (Eptesicus fuscus), the little brown bat (Myotis lucifugus), and the tri-colored bat (Perimyotis subflavus) have been susceptible. The UWI study is one effort to monitor bat populations, health and behavior while scientists find cures for the disease. So while bats may be on the top of the list of scary creatures for many Chicagoans, the scarier proposition is that there would be no bats left. At least, that’s how Rory Keane feels about it. He points to a scene most Chicagoans can relate to. Chicagoan Rory Keane got us looking into bat habitat a few years after he nearly stomped on one that was hanging out in the Loop. 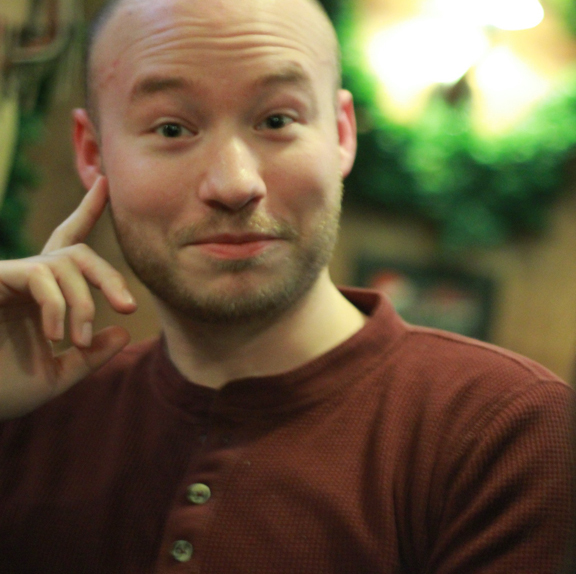 A graduate from Northwestern’s Medill School of Journalism, he’s worked as an English teacher in China and is currently working as a digital marketer in Chicago. So, he’s no stranger to new experiences, but he still didn’t expect to get a new perspective from that one, tiny bat in his hometown. Jennifer Brandel is Curious City&apos;s senior producer and Logan Jaffe is Curious City&apos;s multimedia producer. Bat and habitat illustrations by Erik Nelson Rodriquez.